ESWECO is an acronym for the company “Speiermann, Weigel & Co. Chemnitz”, which was basically a large warehouse and store selling car parts, bycicles and electrical appliances. Components bought elsewere were assembled or complete bycicles relabled to be offered under a variety of brand names. Seven of even more bycicle brand names in the 1930’s from the company. A man living in the rather poor Erzgebige region in Saxony had lost his job during the depression years of the late 1920’s. 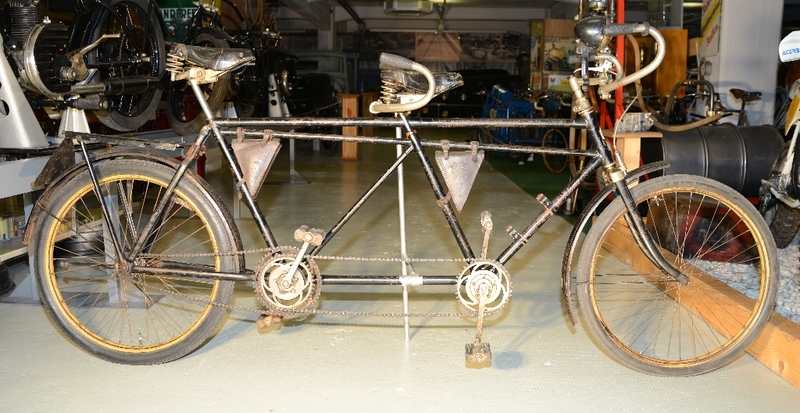 Unable to find any employment he bought the tandem and set out for a journey in search for work, together with his son. Sleeping in cheap hostels or for free in farmhouses werever the found work, father and son regarded it also as an opportunity to travel parts of Europe, meeting other cultures. That is something their contemporaries could only dream of. Most people from their village would rarerly ever travel further then the next town. A triangular metal plate at the rear of the bycicle sports little badges inscribed with sights and places. Among them are cities in western Germany an in what is today the Czech Republic, Austria, Lichtenstein and even Luxemburg. After a couple of month our “work migrants” returned home safely. Luckily their means of transport survived so that we can tell the tale.